Enrique Plaza Garcia, Product Marketing Manager of Microsoft Power BI Embedded, recently had a chance to catch up with Phil Dixon, CEO of ZynBit, to hear more about ZynBit’s innovative product and how they’ve incorporated Power BI Embedded into their offering to drive value to their customers and increase monetization opportunities for sales and marketing teams. 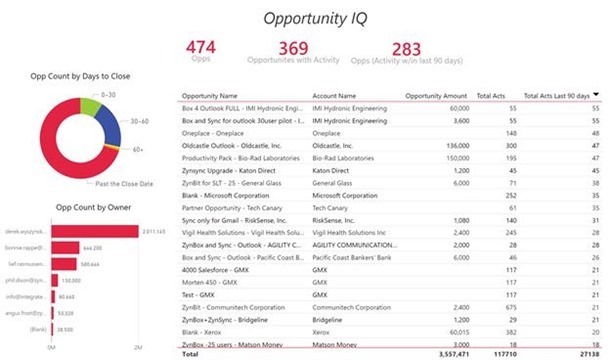 Let’s take a look at how this successful start-up has leveraged Power BI Embedded. Enrique: Welcome Phil. Can you give us a brief overview of ZynBit and your journey so far? Phil: It’s been an amazing ride the last 2 years! We built ZynBit because we felt there was a major opportunity to give sales and service teams a better CRM experience and at the same time embed customer insights within their inbox, enriching email conversations with both CRM and provide useful prospecting data. We launched ZynBit in 2015 and didn’t charge for it initially, because we wanted to garner as much feedback from potential customers as possible. Now we have over 4,000 customers across the world using ZynBit to increase sales and deliver a better customer experience. Prospect and customer insights was always at the core of our mission with ZynBit. Our front end user experience is delivered through Outlook and Gmail and our backend platform is built on the Microsoft Azure Stack for security and scale. 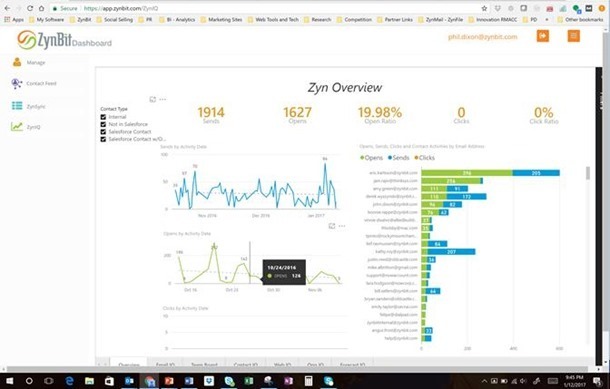 We were extremely pleased to know Microsoft would be launching Power BI Embedded for developers and now Power BI is part of the ZynIQ user experience. Enrique: ZynBit has done a great job innovating in the sales enablement and analytics arena. Can you tell us a bit more about how Power BI Embedded is shaping the next generation of sales? Enter ZynBit & Power BI Embedded. With ZynBit and Power BI Embedded, sales and marketing are integrated teams with customer data spanning across the marketing funnel and through the sales pipeline. 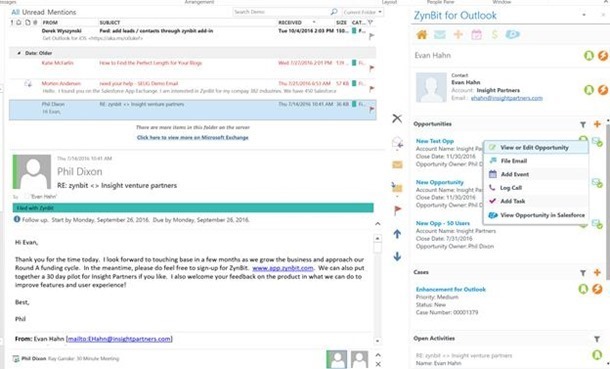 ZynBit integrates with Outlook, Gmail, Salesforce and your company website. 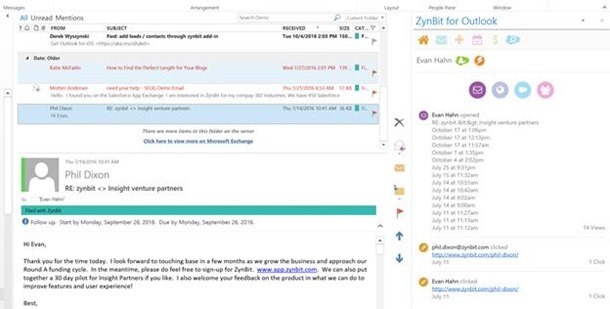 ZynBit delivers web visitor history, CRM data and email tracking to the rep where they work – their inbox. A convenient and familiar interface with a single customer centric view. ZynBit lives inside of your inbox, whether its desktop, web or mobile. Now, sales nerds know which leads are opening their emails and which pages they’ve visited so they can customize and personalize email conversations based on what the customer is most interested in. They want all of this information, including the CRM data, neatly organized alongside email conversations and meeting invites. Once a lead converts to an opportunity, a sales nerd wants to know who else at the customer account has visited the company website or opened emails from other team members. They want to know if a proposal is opened and read or if it’s been forwarded to a key decision maker. Sales Managers want to know which of their team members are doing the best work and getting the best results. For marketers and sales managers, ZynBit leverages Power BI Embedded to visualize and explore the customer journey – from lead to opportunity to cash. 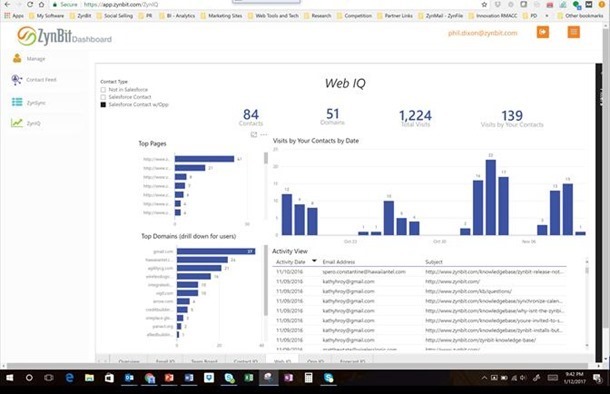 Power BI Embedded enables sales nerds to understand customer interest and have the ability to follow up in a relevant and timely manner. They can understand which opportunities have the most activity in the last 30-60-90 days to validate their forecast. Enrique: Why did you choose Power BI Embedded? What are the benefits for you, as a start-up, in this BI selection? Phil: We built ZynBit on the Azure Microsoft Cloud, which offers performance, scalability and security. 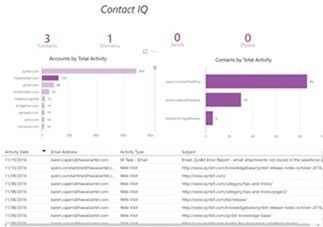 Power BI Embedded was a natural fit with its ability to help ZynBit customers visualize customer data. We evaluated several solutions, focusing on user experience and design, the ability to tell stories with data, and ease of integration to the ZynBit platform. Power BI Embedded offers a flexible pricing model with no upfront investment for developers, which is great for developers who need time to test and validate their product ideas. The pricing model is also nicely positioned for scale with a consumption model, which makes it easy to calculate and integrate into our subscription plans. Enrique: What about the technical aspects of Power BI Embedded – what capabilities were important for ZynBit? Phil: Technically, the ability to support multi-tenancy and row level filtering were must-haves for us. Power BI Desktop helps minimize data engineering and development cycles. The out-of-the-box UX supports interactive and dynamic filters, which was a great value add for our customers. One of the most unique attributes of our partnership with Microsoft and Power BI Embedded is the open market place for sharing and leveraging custom integrations. Enrique: Can you tell us about how ZynBit approached security relative to Power BI Embedded? Phil: Power BI Embedded made authentication and authorization a lot easier than other solutions we evaluated. Most other solutions required us to maintain users in two different places (our servers and theirs). We didn’t want to keep two user directories in sync and have another process to manage. The integration with ASP.NET allowed us to use the Microsoft server side libraries to easily embed dashboards in our ASP.NET MVC pages. 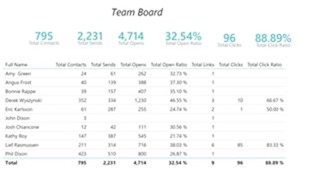 The Power BI Embedded API library was simple to reference in our project and with a few lines of code, we were able to embed our dashboards. Hosting Power BI Embedded reports was extremely easy with Azure. Many of the other options we looked at required us to provision VMs to manage hosting dashboards, which would require a lot more overhead for planning, building, and ongoing maintenance. Lastly, the samples were great. In a few hours, we had a sample dashboard embedded in our development site. Enrique: What does ZynBit have in store with Power BI Embedded in the Future? Phil: We’re planning to integrate Google Adwords and social campaign data to track the B2B buyer journey from lead to cash. Our customers want to see which marketing campaigns and content are producing the most leads, which of those leads are converting to real sales opportunities, and which convert to revenue with the greatest ROI. At the end of the day, we believe we can save companies a lot of money and increase revenues by helping companies understand what their customers are most interested and where their marketing spend is best allocated. Enrique: Thank you Phil. It’s been a pleasure talking with you about ZynBit. We look forward to continuing our partnership together. Please stay tuned for additional insights and story posts coming your way. For more Information on ZynBit, please visit their website. Learn more about Power BI Embedded.